With blockchain being a superstar technology in every possible arena, how could Fintech or financial technology have stayed far behind? Without any second thoughts, we all can agree that Fintech has proven its mettle amidst the continuous growth and innovation in every sector of the technology. Now, the news of Blockchain taking over Fintech is not far beyond that. With the uncountable places that blockchain has improved the technology of use, Fintech is one of the most important ones. In the next eight minutes, we will learn how Blockchain technology has captured and secured the world of financial technology with its one-of-a-kind capabilities. Let us recap what Blockchain is all about so we can have a better understanding of which parts of the technology can be put to use for Fintech. And in case you need a more concentrated on the business version of the technology, head on to our Blockchain Guide for Entrepreneurs. The blockchain is basically a database which is different from the databases we have been using till date. It is a decentralized digital ledger that holds records of digital data or events in a way that makes them tamper-resistant or “immutable”. While many users may have access, inspect or add to the data, they can’t alter or delete it. According to a study published by Statista about the Blockchain usage opportunities among financial institutions worldwide in 2016, the most used was made for international money transfers, which was about 60%. Other usages included, KYC and anti-money laundering, predictions and stock markets, collateral management, trade surveillance and so on. It was made clear through the study that even though the percentages of use cases in fintech of blockchain were still in the initial stage, there were too many possibilities for the technology to be made use of. In this article, we will understand and analyze what kind of impact this technology of blockchain will have on parts of Retail Banks and Investment Banking and what the future holds for the people. 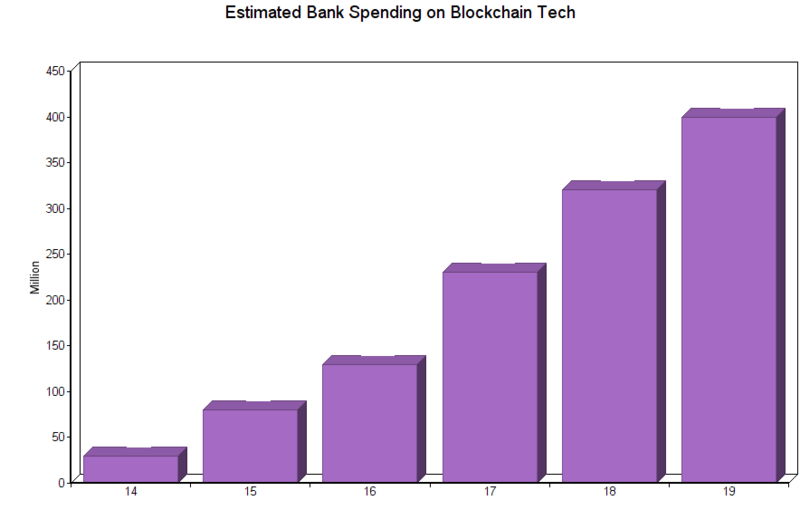 A study was published by Accenture and McLagan in 2017 stating that about eight of the world’s ten biggest investment banks have been forecasted to implement blockchain technology in banking. And in effect it is approximated that implementation of blockchain will retrench their costs by 30% – to state in absolute figures – between $8 and $12 billion. How does Blockchain fill the gaps in banking? There is imprudent bureaucracy and indeterminate incompetencies in most banking setups, and these concerns are majorly pervasive in the clearing and settlement domains of the banks. These gaps which are created by the sheer primal ways of banking and the involvement of hierarchy at multiple levels can be avoided if there is a decentralized system which allows consensus mechanism for faster transactions – hence the need for Blockchain is justified here. Accenture estimates that the adoption of blockchain technology in the clearing and settlement sectors of banking could save the biggest investment bank close to $10 billion. Not only this, but the Australian Securities Exchange has already executed a project to transfer its post-trade clearing and settlement to a blockchain system. All the major and central banks across the world are contemplating the potential of introducing their own cryptocurrencies based on blockchain technology, such as the standalone cryptocurrency – Bitcoin. Since Bitcoin cannot be regulated or influenced by any sort of monetary policy, the aim behind launching the state’s own cryptocurrency is to that, any digital currency provided by the central banks will reduce the popularity of all the standalone cryptocurrencies. This will give the central banks absolute control over monetary policies and financial regulations. 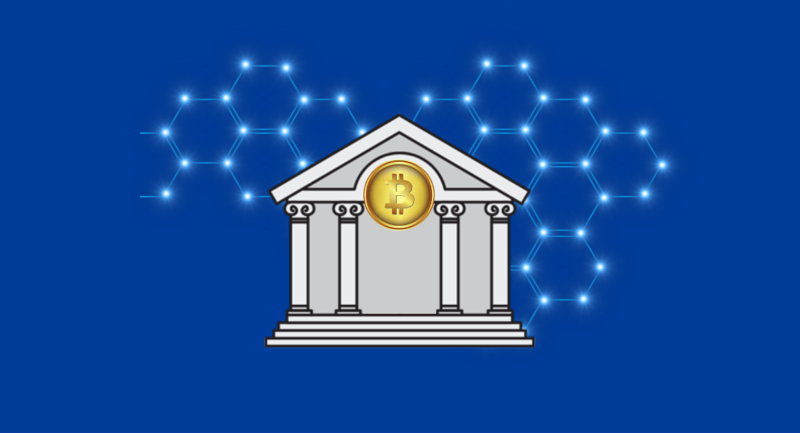 Moreover, banks are fully aware of the real benefits of digital currencies (Based on blockchain technology) over physical currencies, such as, lower transaction costs, faster transactions, etc. This is persuading all the financial bodies of the world to explore the possibility of making the shift to digital currencies and bringing blockchain technology into their payment system. Besides this, the payment system as we know it today is not absolutely efficient either, which calls for an alternative way of payments in which cryptocurrencies can be fulfilled. Today, we have three major financial services available – internet payments or credit card payments, international money transfers and providing banking services to the unbanked. Firstly, we forget that the Credit card was invented before internet and thus it has been tailored for physical payments, rather than internet payments. Therefore, internet payments through credit cards pose three major issues, consisting of – High Processing fees, fraud and security concerns. These can all be very well taken down by Blockchain Technology in banking. Secondly, the system of international payments is still standing at a very rudimentary stage. It is a closed and compartmentalized system. International payments generally take more than a day to process and can only be achieved during the opening hours of the payment agencies because before reaching its destination, your payments will transit through multiple banking systems having their own different processes. These steps notably increase the work of cross-checking data. And cryptocurrency is the answer to this. With the implementation of blockchain in fintech and banking, the problem of cross-checking data across different organizations involved in international funds transfers will be streamlined and easily authenticated over several levels of checks. And finally, providing banking services to the unbanked – decentralized ledger technologies will provide the opportunity to the people who are unable to open bank accounts, to have access to banking services through their smartphones. As per a report issued by McKinsey, about 2.5 billion adults have no access to banking services, which is almost equal to half the adult population of the world. But a significant chunk of these groups are now equipped with smartphones. And smartphones can enable them to send or receive payments or give them direct access to microcredit. Trade Finance is still relying on paperwork circulated across the globe for an affirmation of information, i.e., documents are still being posted or faxed . Being in such a primitive state, it is clear that blockchain technology can revolutionize trade finance. The need for authentication being a stamp will cease to exist once blockchain technology takes over. According to The Financial Times, banks like Commerzbank, Bank of Montreal, Erste Bank and Caixabank have teamed up with IBM and UBS in 2016, in a new project called Batavia, to build a new system for global trade finance using blockchain technology. In 2017, Maersk and IBM collaborated to introduce the world’s first industry-wide cross-border supply chain solution on blockchain. The solution is said to help in the management and tracking of the paper trails of millions of shipping containers across the world by digitizing the supply chain process from end-to-end to enhance transparency and a highly secure sharing of information among trade partners. The identity of the person who is getting involved in banking processes such as loaning, investments, or even simple transactions is of utmost importance. With crimes such as identity theft and money laundering, no one can be trusted without enough background checks. 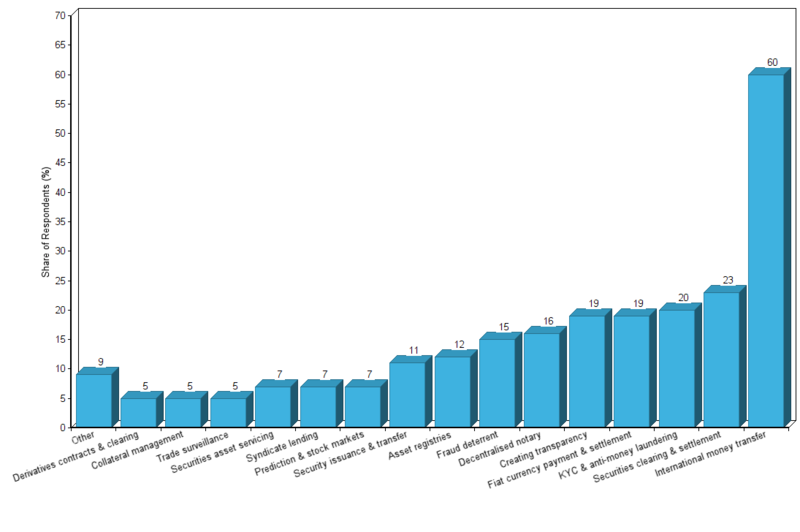 And despite of numerous data checks, people still manage to follow through these crimes. This calls out for an airtight data authentication and identity checks for banks to know the person they’re lending money to. For several years, banks have struggled to devise a system that is easily updatable and shared databases for customer identities. And with the breakthroughs happening in blockchain technology, it has become much easier for banks to verify the identities and backgrounds of their customers quickly and also crack down on money laundering. Blockchains can be a key technology in increasing the efficiency of the syndicated loan market. Theoretically, on average, it takes 19 to 20 days for a loan transaction to be settled by a bank in the United States. If there arises a need to make a transfer of loans between banks in case of early repayment of the loan, the communications in these cases are primarily delivered by fax. In a press release in 2016, Credit Suisse announced the successful initial stage completion of a project to demonstrate the use of blockchain technology to improve the syndicated loan market. There is an ongoing study to put Smart contracts to overhaul the entire lifecycle of a loan. Blockchain and its coming impact on financial services can be very well identified in these use cases. Blockchain technology in fintech provides solutions to a range of difficulties and problems. Although, being of utmost importance, blockchain also has some shortcomings like any other new technology. For instance, all the inefficacies will not be resolved by themselves and the whole idea implementation of blockchain may come at a high initial cost. Nevertheless, the benefits of blockchain outweigh the shortcomings anyday. And as mentioned in the above points, the use of blockchain in fintech is already being undertaken by big companies like Credit Suisse and the Australian Securities Exchange. This is evidence enough to evaluate the blockchain impact on banks and financial services. What the Future Holds for Blockchain in Fintech? Looking at the developments in Fintech, one can very well make predictions about how the financial services of the world will evolve over the next few years. Since the relevance of Blockchain technology in fintech is increasing, it is highly likely that the number of disruptive blockchain based Fintech firms will increase in the future. 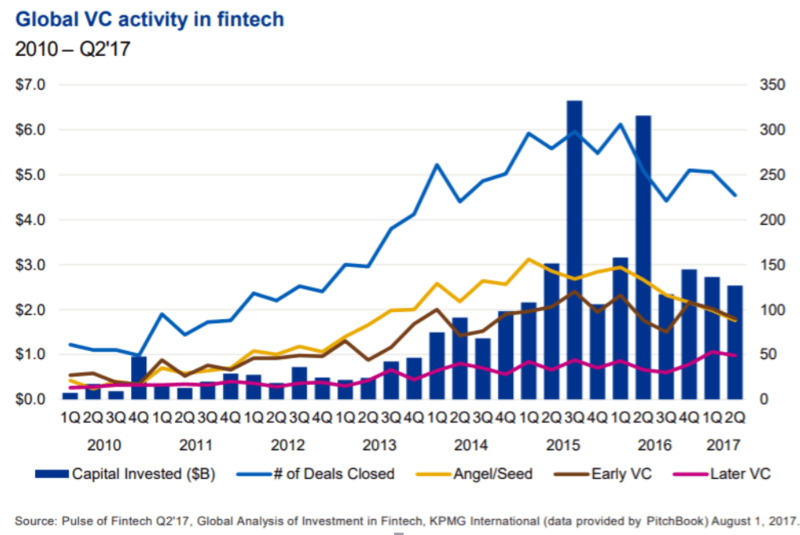 If we take a look at Global Venture Capital (VC) from 2010 to Q2 2017, we can see that inventors continue to remain interested in Fintech across the globe. Other than that, the sharing economy is likely to be integrated with the financial system. In the future, consumers will of course need banking services but may not use banks at the intermediary for those services. It is even possible that innovations in Fintech will allow money lenders to entertain borrowers without the intervention of a bank. Financial institutions or fintech payment processing systems across the world can implement Blockchain to reduce costs and increase the speed of transactions. Blockchain can be seamlessly merged with the banking industry in order to create a decentralized client identification system. This is important, since all the credit organisations need to perform KYC before processing applications. Blockchain can help in user identification on a single occasion and that information can be stored in a database that is common for all the banks in the system. When it comes to the case of loans and credits, the entire banking system, including those of the most developed nations, has been unreliable and vulnerable to some extent. In such cases, a distributed system for loans and deposits which is based on ledger technology that is not only decentralized but also immune to any kind of financial fraud is highly required. Conventional insurance systems can be improved notably by the automation of payments in case of insurances. Moreover, the usage of smart contracts will help significantly in eradicating the long bureaucratic delays that happen due to the involvement of a large number of managerial members. Time and innovation have opened doorways in fintech blockchain technology that nobody could have imagined 10 years ago. And there are advancements happening in the technology of Blockchain, as we know it. Currently, the bifurcations of blockchain which are most used include Hyperledger, which is an umbrella project of open source blockchains and R3 Corda, which is a new version of the blockchain platform devised by R3. For further discussions, there is a new technology in the lines that can be called the second generation of blockchain. Tangle is based on a DAG (Directed Acyclic Graph) which has been designed keeping in mind IoT (Internet of things). Tangle does not have a traditional “block” and “chain” as it does not rely on the architecture of blocks joined together by cryptographic hashes. Although it does retain the fundamentals of Blockchain such as a peep-to-peer network, a decentralized database and a consensus mechanism to validate transactions. But more on that later. There has been an open plethora of possibilities that could change the financial decision making of every person on this planet, let alone the banking system. A more secure and viable technology awaits us to be explored. An entire guide to blockchain can help us understand where can this futuristic technology can be put to use. The initiation of this revolution has already happened. The people, the banking systems, the blockchain development companies, the government, everyone is working together for a smarter future with the help of blockchain. Apart from the initial investment in the making of a functional application based on Blockchain, it is only going to ease our daily lives. With blockchain and fintech going hand in hand, we will see the rise of an easier banking era in front of us. Rest, we will learn more as we go.